Whether about ancient Aztec poetry, pro-wrestler Ox Baker, the Prophet Elijah, small arms traffickers’laments, game show hosts, a fictional dysfunctional family called The Alpha Couple, or any one of the hundreds of geographic landmarks, John Darnielle (a.k.a. 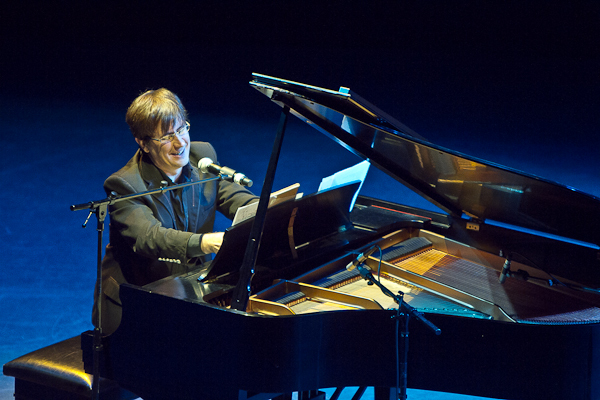 The Mountain Goats) has been writing these songs that sow the fields of American Folk music for over 20 years. The music on his 14 LPs or so never veer too far away from a simple acoustic guitar backed with tape hiss or piano arrangements backed with a horn section, but his fans are legion and he is an institution in American music, however indie he remains. So if you’re so inclined, you can sign a petition to help make John Darnielle the 20th U.S. Poet Laureate. If selected, Darnielle would be the first musician selected to the post (over Seeger, Dylan, Cohen, and Springsteen to name a few). Danielle would succeed 2012 Poet Laureate Natasha Trethewey, who previously served as Mississippi’s Poet Laureate, and was awarded the 2007 Pulitzer Prize for poetry. Pulitzer Prize, huh? That’s great and all, but you really should have heard Darnielle cover Dio’s “Rainbow in the Dark” this summer. He could have won the Nobel Peace Prize for that performance alone.